Whenever the release date hits for new sports titles, there is an almost immediate seed planted by many in the community where they say “that’s cool, but what will they fix next year?” And this is how wish lists are born. Many times, these wish lists include elements that are already present somewhere else, or perhaps were better executed in the digital past. While it is generally agreed that competition breeds better games, what if we went the opposite route and attempted to create a title with the best features each major entry has to offer? A natural starting place is the perennial powerhouse in sales: EA Sports’ FIFA series. What is it that makes it such a heavy hitter? The international nature of the beautiful game is no doubt a boon, but there must be more to make it click as a video game juggernaut. And within that thought is the answer. FIFA, from the national squads to the lower-level domestic clubs, is all about availability. Still managing to outpace a catching up Pro Evolution Soccer in licensing, FIFA has presented an impressive array of worldwide leagues, as well as the addition of new stadiums year to year. The fans that fuel the passion of the sport carry their chosen club’s heartbeat as their own. And so, the element needed from the FIFA series is the dedication to replicating the look and feel of as many clubs and nations as possible. FIFA’s strong international sales are in no small part due to gamers in pockets of Asia, South America, Europe and elsewhere being able to use the same clubs that adorn their personal space and wardrobe, and bring them to glory. Other sports games have attempted to flesh this out. While NBA 2K has utilized the G-League and FIBA, and NBA Live introduced WNBA players, both titles can be inconsistent with their inclusion or scope. The WWE 2K franchise boasts the largest roster annually, yet continues to remove past (and sometimes present) grapplers, and arenas. UFC 3 boasts an impressive list of fighters, but for an organization that has acquired former stalwarts like PRIDE and Strikeforce, a surprising few legacy warriors have appeared to welcome the allegiance of their die-hard fans. Very rarely does the FIFA team take a step back in this department, and the consistent drive to provide more players, teams and venues is critical for the new “ultimate” game we’re creating here. Once you have found your team, what is it that brings us back for more? While some are content with hopping into an exhibition game or online play now for a round or two, the true meat of any sports game has always been its franchise mode. There is no experience quite like battling through a season, postseason and championship. There is no satisfaction like placing the winning bid on a prized free agent or taking a chance on a draft pick. There is no greater heartbreak than seeing a fan favorite retire, or watching an injury bring a player’s season to an end. And there is no greater title that wraps these elements together than NBA 2K. Our new game needs the control and scope of MyGM, with the option of having a more narrative-driven season, or a completely open-ended one. For those wanting absolute customization of their experience, MyLeague is the closest thing to feeling like you developed the game yourself, allowing for myriad possibilities to tweak your personal dynasty and make it your own. One flaw in franchise modes, even NBA 2K’s, is that once a new game comes out, you must start all over. This breaks the immersion and can be deflating. Here, we’ll need MLB The Show’s year-to-year save system, first introduced in MLB The Show 15. It’s a travesty that other titles haven’t picked up on this yet, but luckily we have a game series that has not only done it, but made fundamental changes to the way Road to the Show works. Even with these monumental shifts, it still offered a way for your transferred player to adjust to the new system. For those who don’t necessarily want the grind of multiple seasons but still want something to work toward, Ultimate Team has provided a unique platform. 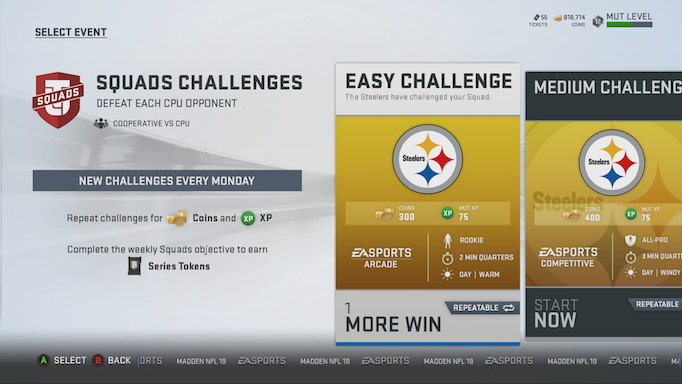 Part collector’s guild, part competitive online machine, Madden has arguably whipped this formula together better than anyone else. The addition of solo challenges allows a reprieve from online trash talking while providing unique rewards. Different events throughout the year present the opportunity for new loot, and the thrill of filling out a roster of straight intimidation leads to bragging rights on the field. Crucially, MUT Squads filled in the missing co-op piece to make the mode truly great. MUT Seasons, MUT Champions, MUT Draft — yeah, the guys in Orlando have us covered. UFC 3 improved on its predecessor with one of the best playing games in terms of fluidity. Building on the legacy of Fight Night, and Knockout Kings before it, the UFC franchise has made how the human body reacts to impacting and being impacted a thing of art. Sweat flies as a knee connects flush with the face of the unlucky, and their body spins to the mat in a way that only gravity itself could replicate. Their fantastic work in physics will help our title shine in gameplay. Finally, while games like NBA 2K and UFC have done stellar work with commentary and the pre-contest atmosphere, there are two other titles we can look towards to further inspire the presentation department. NFL 2K5 is legendary for a lot of reasons, but oftentimes its halftime show is mentioned. There is nothing dazzling about the footage, and Berman doesn’t sound as crisp as EA’s current halftime commentary, so what is it that stands the test of time? Simply put, NFL 2K5 had a flair for making you feel like you were watching a television broadcast. Other titles capture this in glimpses, and EA was on the right track with, for instance, CBS and ESPN integration in NCAA March Madness 10. But few games take that pregame, and sometimes postgame feel, and apply it wholesale to an entire experience. This includes not only halftime, but even off-days. What is happening in the rest of the league in terms of practice, off-field/court news, and signings? Why do Monday and Thursday Night Football not feel like marquee events? Why am I only aware it’s a holiday when it’s mentioned in passing on the field? How did I not know it was Jackie Robinson Day until someone changed my jersey number? These moments as a broadcast element are shown to have worked via the College Hoops series and their excellent in-studio Selection Sunday show. There was a palpable feeling of tension watching the seeding play out, and something that is very much missed. Where is the studio update to highlight a playoff-deciding week 17 game, or a season-defining game 7? Utilizing the foundation of College Hoops and NFL 2K to build a dynamic in and out of game presentation is critical to bringing this entire package together. Here then is a blueprint for the “ultimate” game, based on what has been done before. We have examples to draw from that show each development team individually finding strokes of brilliance — and can dream of what would happen should their powers be combined. Harboring a total dedication to updating and expanding rosters and venues is a must for connecting to the players and fans. Mastering the customizable options for an offline or online franchise, as well as enticing ways to play with Ultimate Team ensures neither crowd feels left out. A cutting edge approach to movement will provide the base for any sport to shine. And the presentation, we can’t forget about the presentation. Pregame, postgame, off-day, weekly updates, full team introductions, even an extended workout with your team as a studio panel breaks it all down before the big game are all needed here. A broadcast package for the ages will keep our blood pumping day after day. Bring these elements together, and we sports gaming enthusiasts may be reported as missing persons. Take Fifa's gameplay, but replace the career mode and depth with Football Manager's and boom, perfect game. In NBA2k a6 minute quarters stats will reflect teh appropriate stats league wide. in MLB THE SHOW setting a dynasty mode to say 6 innings will also reflect the appropriate stats. why has Madden never done this. Easy as pie, eh? Does that translate to other sports? In NBA2k* a6 minute quarters stats will reflect teh appropriate stats league wide. This sort of scaling missing always bugs me. My fiance playing in our franchise was like "im leading in defense!" And I have to tell her...yeah but uh.. the CPU's numbers are janky. Actually EA tried that with FIFA Manager 2011 and FIFA 2011 if you had both PC games you could play out the games with FIFA from within the Manager game, it was very clunky but I thought if they refined it would be a great idea, but of course they never tried it again. Just imagine The Show with OOTP ! Bottom line customization is what is needed and I don't mean haircuts and shoes. Our specialized Sport Court playing surfaces and sports components will stand the test of time, and are designed to integrate together, making it possible to play dozens of games, activities and sports on your multi-game sport court. Are you looking to develop the sports betting game app and websites? We are have an expertise in sports betting game app and web development. We have been developed various spotsbook to bet online. If you want to develop the Sports betting app then you can DM me. You can check our websites for Features And Supports, quality That provide by my side and contact us to get the best solution.